To improve the experience while using UTOPIA, we have introduced the Dashboard to help the user add all the requested information as part of a guided process. 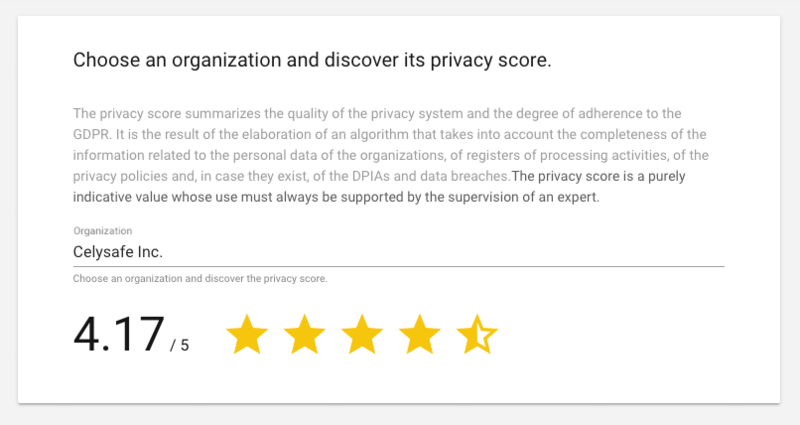 ‍Privacy Score: A numerical value, calculated through a custom algorithm, which, based on the data entered, returns a score from 1 to 5 indicating the general level of data protection achieved by an organization. Percentage of completion: represented by a blue card, it takes into account the information entered. You have the average percentage of completion of data for each section. Statistics: numerical indicators into the white cards that offers a detailed analysis of the current situation. Clicking the menu Dashboard, you can directly access your dashboard in order to monitor the status of the organizations via easy-to-read indicators. Each card has a bullet indicator (red, yellow or green) that suggests the completeness of the data inserted and a handy tooltip that explains which data are taken into account in the calculation. If you are new to UTOPIA use the Dashboard as a guide to all the requirements of the law. If a section is still empty, start the wizard and save a lot of time and resources to compile it. Organizations: shows the level of data completion of each element of an organization. In case some possible figures such as DPOs or data controllers are not entered, their card will also disappear and will not count for the calculation of the average % of completion. Assets: indicates the number of assets entered, which ones are involved in a processing operation and which ones are not, where they are, if they are internal to the data controller or the data processor. Processing activities: indicates the number of records of the controller or processor and their current status, whether under processing, active or suspended. 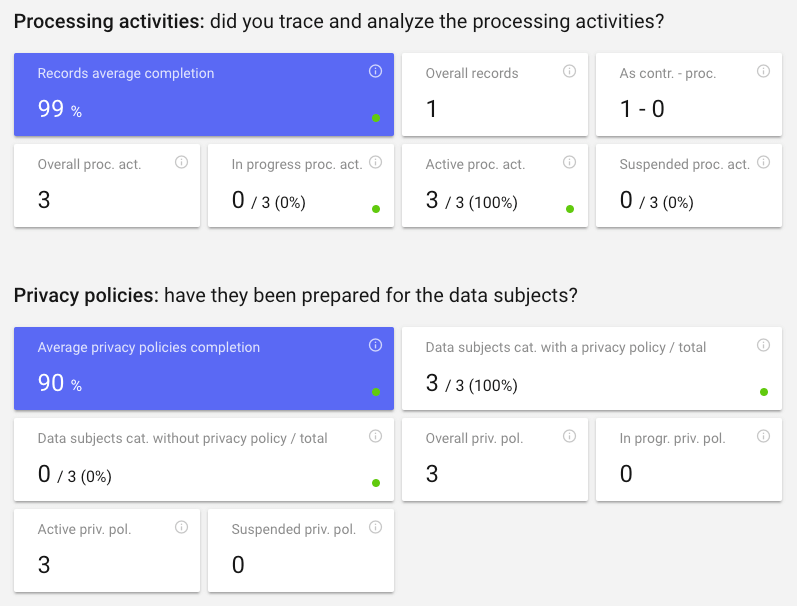 Privacy policies: indicates how many categories of data subjects have been informed about the processing of their data and how many have not, as well as the number of total privacy policies managed, including their processing status. DPIAs: shows statistics on processing operations subject to impact assessment, their status and details of risks and measures applied in addition to the deadline set for periodic reviews. Data breaches: shows the total number of recorded breaches, the status of the events to be analyzed, the number of notifications to the supervisory authority and the time elapsed since the last breach. Getting an organization to be fully compliant to the GDPR is a complex task but with the help of the Dashboard it is much easier.